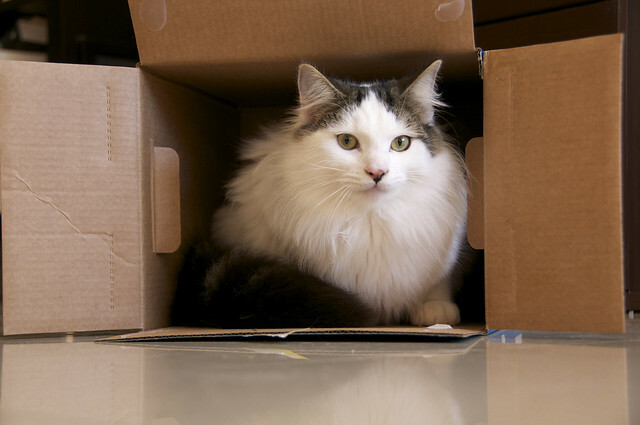 Our cat litter comes in boxes, which make for excellent toys! 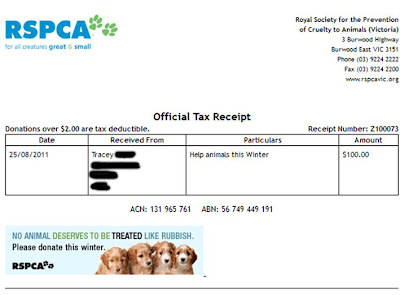 Today's report is a short one - I had mum make the donation to the RSCPA and here is the receipt as proof. Thank you again to everyone who helped me with my commentathon! The pupparrazzi around here think they're pretty good, but they still managed to cut my ears off in this photo! I would like to thank everyone who contributed to my commentathon. I got lots of comments (although I didn't get anywhere near 1,000) and my parents are going to donate $100 to the RSPCA. Thank you to everyone who commented, and mentioned me on their blogs to encourage others to come and visit! My friend Bernadette from Tales of Tails also got 26 comments on her blog post about my commentathon so we are counting those in the total as well, which means we got 205 comments in total! That is pretty good, I think. Mum says we have to take the rest of this week off because she is busy (hmpf), so I will be back next week! I still have more Ask Huffle questions to answer, so look out for them in the near future. Also, I said I'd send a little present to the 100th commenter who was... Auntees! Please email me so I can find out a bit more about you. Wow. 1,000 posts. I never thought I'd make it. I would like to thank every single one of my friends for helping me get here - without your questions and encouragement over the past few weeks (and years since I've been blogging) I never would have made it! 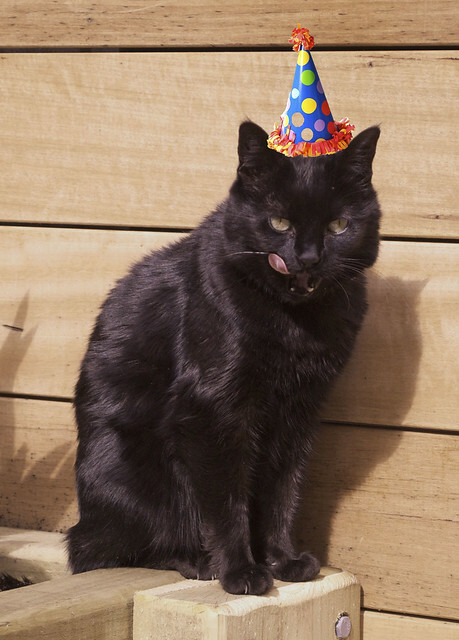 Virtual party hat. No way I am wearing the real thing. To celebrate reaching 1,000 posts, I am holding a commentathon. For every comment I get on this post from now until Sunday night, mum and dad will donate 25 cents to the Royal Society for the Prevention of Cruelty to Animals in Victoria (RSPCA Vic). Please help me raise lots and lots of money for them. You are only allowed to comment once each, but if you have friends or family who blog, get them to drop in as well. It would be totally awesome if I could get 1,000 comments on my 1,000th post. Do you know that many dogs, cats and people? Please help me try to reach my goal! I will also send a little prize to the 100th, and 1,000th commenter. The Katnip LoungeKats asked me: Do you sleep with your Beans? How about The Goon? Well, I used to, but not so much any more. Basically since Teddy arrived, I find it safe to stay in my toasty bed where he doesn't jump on me. Before that, I used to sleep on the bed between mum and dad, and in winter I would sleep between them under the doona. Teddy usually sleeps in his little bed which is in mum and dad's room, but before he goes to sleep he looks for toes to bite, and sometimes he sleeps right on the edge of the bed where he is close to toes. He is a goon. 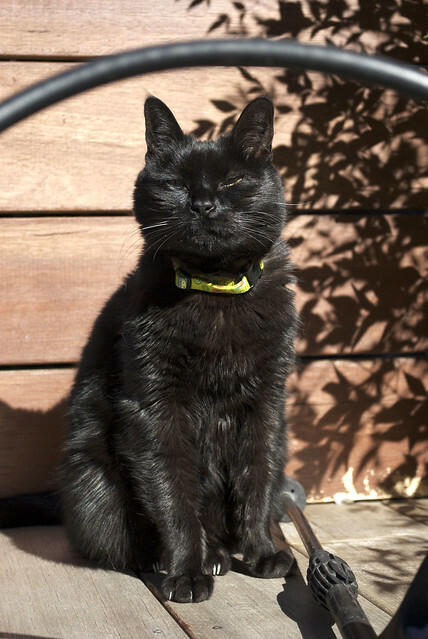 Mr Puddy asked me another question: Anything you love about Teddy? NO! There is nothing good about Teddy. He is a bad kitten and a Naughty Cat. Actually there is one good thing about Teddy. He does not understand the Red Dot game so he just sits there confused when I play. So that's good. Teddy here, to tell you something that is SO exciting. 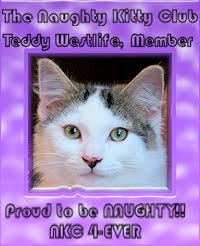 Did you see I was made a member of the Naughty Kitty Club? Prancer Pie asked me this question: As the cat with the most seniority, Miss Huffle, what is your most important job in the household? That is a very good question. I have several jobs in the house. One of them is to make sure dad realises it's dinner time when he comes home from work, no matter what time it is. So I greet him at the door every day and remind him. It is also my job to quality test all the ham that gets brought into the house. Same with the prawns. 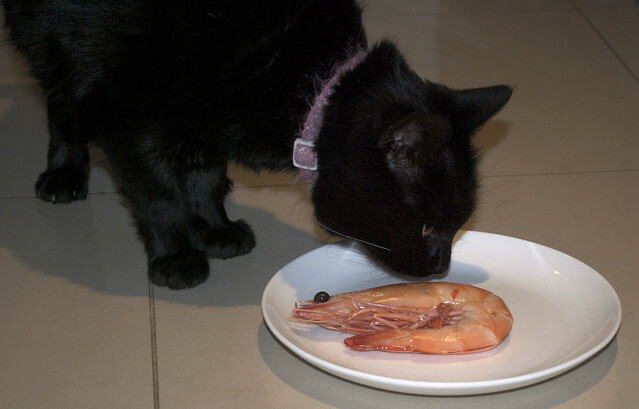 Here's a photo of me doing quality control on prawns. And most importantly, it is my job to make sure all the places a cat could sleep are appropriate for a cat to sleep in. Mostly this involves me sleeping in my toasty bed, or on mum and dad's bed, or on the spare bed, or anywhere else that takes my fancy. 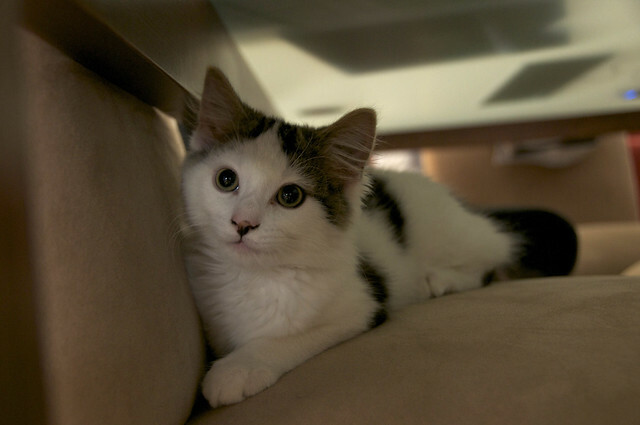 My first ever kitty friend Parker asked: Oh Huffle, how did you become so gorgeous? Thank you Parker, you are very sweet. I put it down to good genes and a generous serving of ham. Labels: ask huffle, is this my good side? Zimmie and Dave asked: When are you going to start treating Huffle better?!!? And Dave would like to know if you have a favorite color. Teddy says NEVER! I am the Bad Kitten Boy and I will never change. Everyone here is shaking their heads at him. As I answered in an earlier post, my favourite colour is purple. So is Davy's, I think! Madi asked me: How did you get the name Huffle Mawson? We are sure there must be a good story to go with your name. I have explained my name before but I will happily do it again for newer readers. When I first got here, five and a half years ago, mum and dad called me Stella. 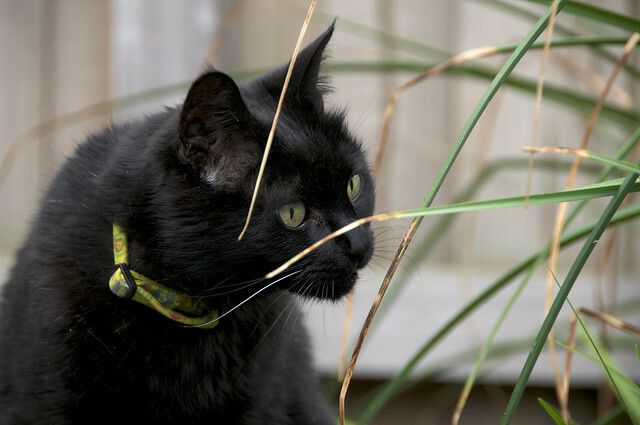 But after a few days, they noticed that I would huff at things as I was wandering around. So they started calling me Hufflepuff (like in Harry Potter). Then, because I like to explore new places, they added Mawson after the famous Antarctic explorer Douglas Mawson. So my new full name was Huffle Mawson and I always answer to Huffle. I don't answer to Stella. Jasmine and a few others wanted to know: do you and Teddy every snuggle up together or give each other a bath? Or do we ever hang out together? The answer is a very short NO. We do not get along because Teddy is a bully and always trying to jump on me and bite me. A few people suggested that we should get Teddy fixed but he already has been, the very day he was old enough. It didn't make one bit of difference to his behaviour. If anything, he is worse, probably because he is lighter on his feet now. 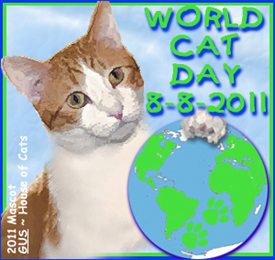 Today is world cat day! 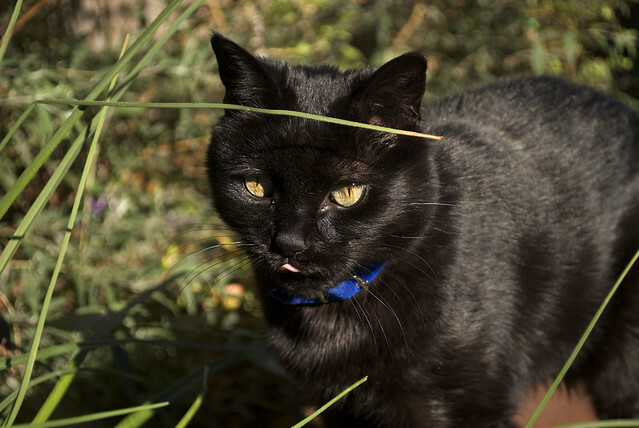 I mean, every day is world cat day but now we get a specific date to celebrate. Here are mum's two favourite photos, one of me and one of Teddy. I hope you like them. My dear friend Diamond in Adelaide gave me this award last week. Thank you Diamond! I am supposed to list 7 facts about myself. This is very difficult because I have been blogging for so long that you know just about everything about me already. So for once I am going to let Teddy the Monster answer this one. But remember that Diamond gave the award to me! Here are Teddy's 7 facts about himself. I have more energy than anyone could possibly imagine. I love to play with my toys and I carry them around the house with me. I still sleep in my special bed that mum bought for me on the first day I moved in here, only it's in mum and dad's bedroom now. If your toes are poking out from under the bed covers, I will bite them. Sometimes I even look for toes by sticking my paws under the bed covers. 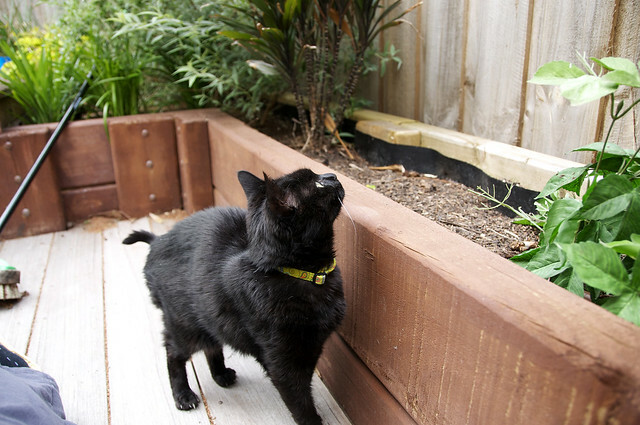 I love to go outside in the backyard and chat to the birds. Even though I fell down between the water tanks once, I still climb up there every day. 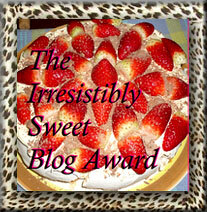 Now I am supposed to share this blog with 15 other bloggers. That's too hard so the first 15 commenters here today should share it! 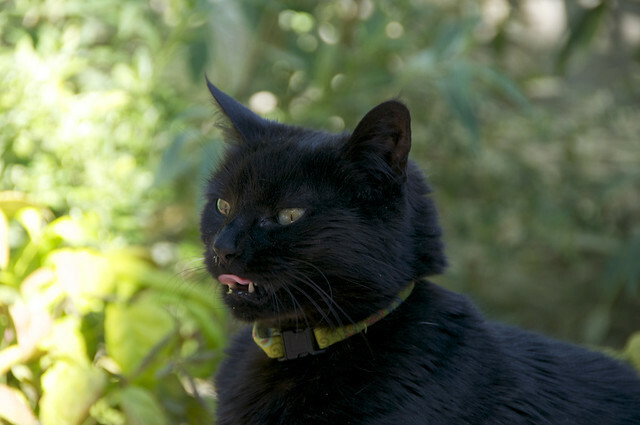 Well Mr Puddy, I have never had fleas since I got here. I get some sort of shot every year at the vet which stops the fleas from coming near me. Or something. Teddy had fleas when he arrived, and he had to have a BATH! Then he got de-flead at the vet and hasn't had any since. Mum and dad keep a close eye on both of us to make sure we don't get fleas. Fin wanted to know: What's Teddy's favorite toy? About 20 seconds after he moved in here, Teddy saw Timmy (a former candidate for the position of my bodyguard) stuck to the heater and grabbed him. He carries Timmy around everywhere he goes, and runs up and down the stairs with him in his mouth. He also loves CatDog, which is a stuffed toy that dad has had for years. He used to live on the half-wall in mum and dad's bedroom until Teddy got here. The second day he was here, he jumped up and grabbed CatDog (no-one is really sure if it's meant to be a cat or a dog, so it's called CatDog) and carries him around as much as he does Timmy. 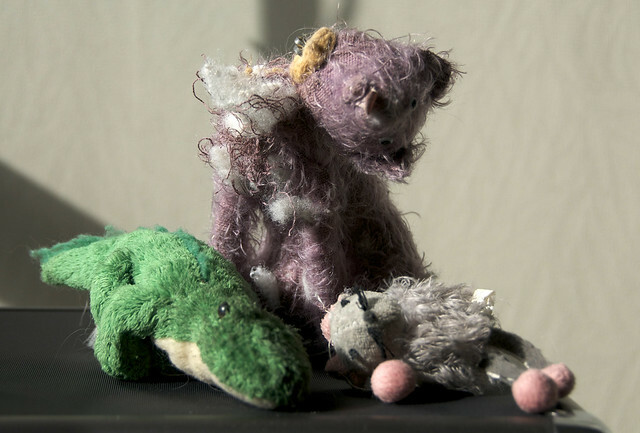 Finally, the grey mousie that used to hang on a string near the stairs that Addie and Lucie sent to me YEARS ago is no longer attached to its string because Teddy runs around madly with it. Notice that CatDog has nearly been decapitated. I am very sorry to report that since this photo was taken, CatDog has lost his head. Caren and Cody asked me: I have a question. Four years ago blogging wasn't even popular yet. What made you start blogging? 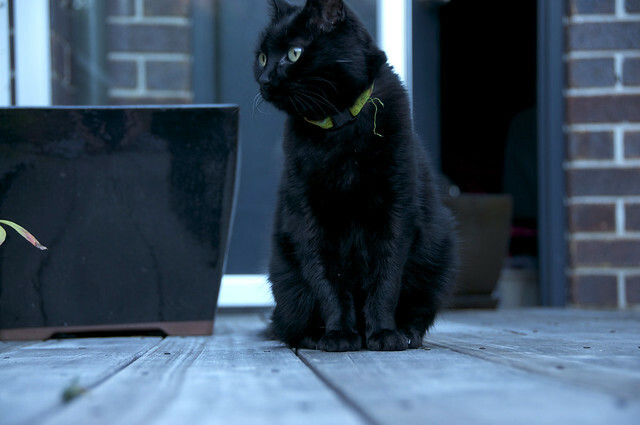 Well, it's all because of Queen Meeshka and my bestest friend Zimmie that I started blogging. Mum used to subscribe to the Daily Puppy newspaper, and one day the featured dog was Meeshka, and there was a link to her blog in the story. We read her blog and thought she was pretty awesome, and from there we found the Army of Four and loved them too. I started blogging to get to know them better. For a while I was too scared to leave any comments, and I didn't have any comments on my blog either, but then I got brave and Turbo was the first ever dog to comment here! Since then I have met SO many new friends and mum and dad have even met some of my blog friends' people too! This is just about the first photo of me that ever appeared on my blog. Stella said: I always feel bad when you talk mean about Teddy. Will this ever change? Sadly, Stella, this will never change, not as long as Teddy is a Bad Kitten. He is very mean to me and always jumps on me. Once he bit me on the back and another time he bit my ear. Mum and dad try very hard to distract him and tire him out but that doesn't always work. He also tries to steal my food, and when I have to use the litterbox he lies in wait to attack me when I am finished. 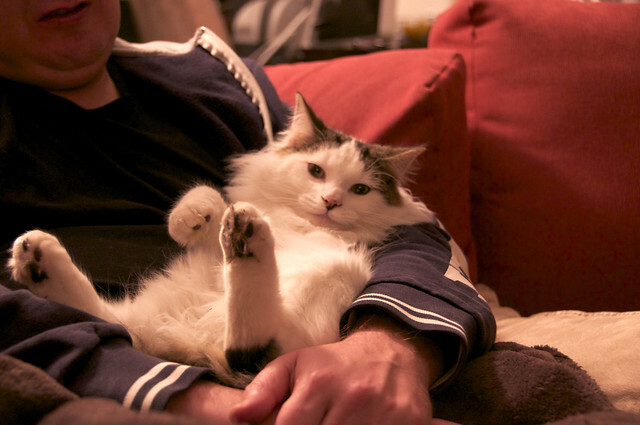 Mum and dad both say they have never known such a naughty kitten. Mum and dad are going away for a few days in two weeks and Teddy will be going to stay with Uncle Andrew, whose cat is Cosi. Remember when he came and stayed here a while back? Everyone is hoping that Cosi will teach Teddy to behave because he is a Big Cat. I will be staying home and my grandma and grandpa will be coming to look after me. Sometimes mum and dad try and stop Teddy from chasing me by making him sit with them. Being the goon that he is, he just sits there. Er, sorry about yesterday. Clearly someone does not understand what "posting every day" means. Holly said:We know you don't like red rugs...do you have a colour you really love? If you were to do something special, what would it be? As I mentioned the other day, purple is my favourite colour. 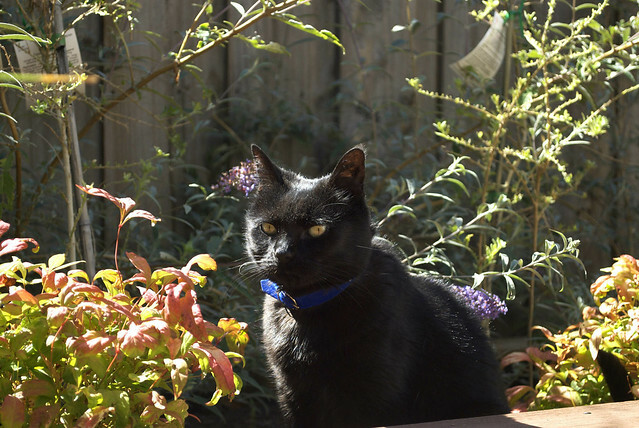 This is me sitting on the purple chair wearing my purple collar, just to prove it. If I were to do something special, it would probably involve eating some prawns. I only get them maybe once a year, which is not nearly often enough for my liking, but I guess that makes them special!